Following the recent shock announcement, this Friday sees the sad closure of the Tesco Wine Community (TWC). Launched to great fanfare in December 2011, the site attracted such high profile names as wine expert Oz Clarke and chef John Torode, and quickly became a hive of activity with users discussing their latest purchases, hot tips and swapping information ranging from favourite producers to what wine goes best with a Chicken Caesar Salad. When added to the regular competitions to fine dine, meet winemakers, and win both bottles and cases of wine, the site became a magnet for new members and grew in popularity. When I first joined I wasn’t aware of just how unique it was in the marketplace, and I double/triple checked all the other main players to ensure that they didn’t offer such an opportunity to get involved. This makes the closure of the site doubly sad as it throws away a true USP (unique selling point) for Tesco and is another nail in the well secured coffin of commercialism over community. Being one of the core of active members, I could see first-hand the effects of the loss of this outlet, be that one of sadness, deflated expectancy, denial, and subdued anger as to how this was being allowed to happen. Ever hungry for a story, the media both in (The Drinks Business, The Grocer) and outside (The Telegraph, The Guardian) of the wine trade ran the story. Although the TWC was a public forum, it is particularly sad that virtually all of the articles actually lift user comments and include them out of context and without permission. These are friends talking to friends after hearing a piece of sad news, and not meant to be the sound bites of a wide reaching media piece. Users had been lamenting for many months the continuing range reductions and favouring of bulk brands in place of well-loved favourites or new discoveries. In truth, ever since it was widely reported in late 2014 that the Tesco balance sheets had a £264m ‘black hole’, and that new CEO Dave Lewis had to make some huge cost-cutting measures, the writing was on the wall that the TWC days were numbered. Goodwill promotional exercises where wine lovers are free to pick apart any and every bottle in the range would be very ‘on-the-ball’ when it came to feeding back their thoughts on range culling and simplification. The undercurrent of confused loyalty had already begun. The closure of the site leaves behind a perfect opportunity for another retailer to jump in and secure a ready base of advocates with a hunger to buy, try and discuss their wine range. Although the number of people registered for the TWC ran to several thousand, it was kept in motion by a core of perhaps 100 people, many of whom have their own blogs and wine forums and would be of a beneficial nature from a promotional perspective. Thanks to the community I have been in receipt of many wines I wouldn’t have tasted and dined with winemakers I would never have met. I’ve also engaged with (and in some cases met) fellow wine lovers and chatted happily about our mutual love of fermented grape juice. 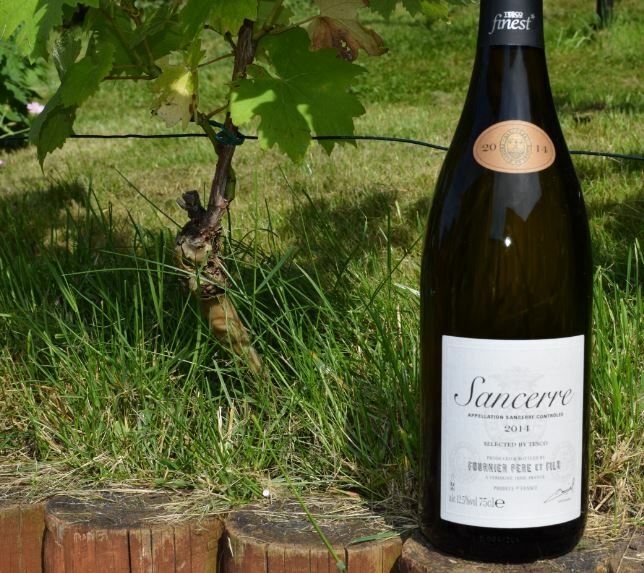 Produced under the Tesco Finest banner, this Sauvignon Blanc based wine is produced by important Sancerre estate Fournier Pere et Fils. Claude Fournier is the 10th generation of his family to be winemaker, and if this wine is anything to go by, he certainly knows what he is doing. In the glass it’s a pale lemon yellow, but the fun begins when you nose the wine. You immediately get an intense mix of fruit, floral notes and tertiary creamy characters. White peach and green apples and pears spring to mind, as well as a little white spice and touches of the pips. The structure is creamy and seriously rounded – full, complete and inviting. The palate is simply melt-in-the-mouth good. At the same time as being effortlessly light and refreshing, the taste is again full, juicy and complex – bursting with flavour. This wine manages to be completely intense, whilst retaining a crafted lightness of touch. I first get a golden sunshine feeling from the ripened green fruit blending well with the tropical peachy notes. This juiciness is underwritten by the refreshing acidity and the lemon and lime citrus notes. The palate, like the nose is rounded out with a generous voluptuous creaminess. The wine clocks in at 12.5% and the seriously long-lasting finish is completely rested on the fleshy green fruit. I’d gone upstairs to do some chores, and made it all the way back downstairs with the finish still lingering long. A beautiful well-crafted wine that this red wine drinker will be buying again. I do hope that, as the Tesco range contracts whilst they get their business back on track, they don’t do away with wines in the ‘slightly more than entry level’ bracket, especially wines of this quality. So long, and thanks for all the wine…..